Consuming flavonoid-rich foods such as wild blueberries can have a significant positive effect on young people’s mood, a University of Reading study has found. In two trials published in Nutrients, children and young people consumed a drink containing wild blueberry or a matched placebo and were asked to rate their mood on a numerical scale before and after the drink. 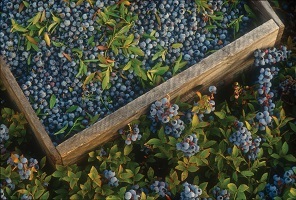 In both trials, participants recorded a significant increase in positive mood after drinking the wild blueberry-infused drink. “Wild blueberries are rich in flavonoids, compounds found naturally in foods such as fruits and their juices, vegetables and tea. They have been associated with a range of health benefits including antioxidant and anti-inflammatory effects, and it is exciting to see their impact on mood in a highly novel experiment. The two double-blind trials used a flavonoid-rich wild blueberry (WBB) drink which was prepared by mixing 30g of freeze dried blueberries with 30ml orange squash and 220ml of water. The placebo was matched to the WBB drink for sugars and vitamin C so that both drinks contained the same levels of glucose and fructose. Participants’ moods were tested to gauge positive and negative mood, and in a trial of 21 young people aged 18-25, participants recorded a significant increase in positive mood after drinking the wild blueberry-infused drink. The trial with children also saw a significant increase in positive mood. “The results of this study are the first to show that consuming flavonoids improved positive mood in both children and adults. The results were seen two hours after people had consumed a single flavonoid enriched drink. Previous Reading research has shown that consuming wild blueberries can improve cognitive function in primary school children, and that other flavonoid rich drinks such as orange juice, can also improve memory and concentration. Research from the University of Reading has also reviewed previous academia looking at the association between dietary intake of children and young people and depression and related mental health problems. Research is still ongoing to determine the exact mechanisms by which flavonoids may exert benefits to the brain. Several mechanisms have been proposed such as improved blood flow in the brain and protecting neurons against oxidative damage and increasing the efficiency with which neurons transmit signals.